A revolution in hydroponic formulation. It is a true 1-part, 100% complete flowering nutrient for indoor flower gardening. 100% water-soluble bloom nutrient with big bumps in calcium and phosphorus. Stop messing around with 2 and 3 parts. For flowering magnificence, try Garden of Eden™ today. 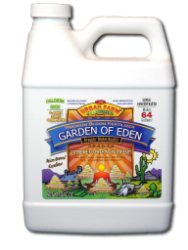 Garden of Eden is a proprietary hybrid fertilizer: part organic, part mineral salts. Especially potent, one gallon makes 256 gallons of full, working strength hydroponic bloom nutrient, assuming an EC of 2.2 m/S.